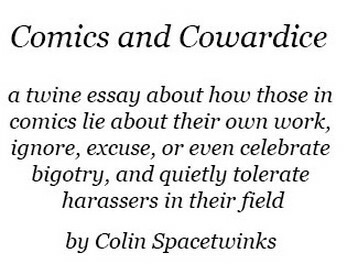 Comics is rife with cowardice. Be it in lying about the themes and actual intent of one's own work - such as in Remender's Uncanny Avengers, Spencer's Captain America: Sam Wilson and Secret Empire, or in Jason Karns' Fukitor - or in the quiet tolerance offered to bigots in the industry - such as the ones offered to Ethan Van Sciver and Frank Miller - or in the glossing over of harassment and abusers within comics, and reacting more viciously at the victims who call them out than at the people who harass them in the first place. Or, in participating in bigotry oneself, and then simply pretending it never happened. 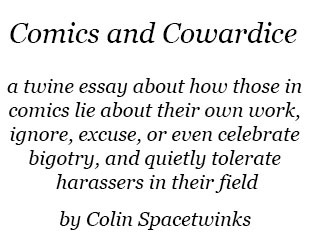 "Comics and Cowardice" looks to examine all of these performances of cowardice in the field of comics, and how they interconnect, and how pros silence and tolerance of their colleagues worst behavior makes the field unable to change, and worse, dangerous to those who are already the most vulnerable. Starting from an examination of Marvel Comics' Uncanny Avengers under Rick Remender to Nick Spencer's Secret Empire, and seeing how creators will dance around and even outright lie about the content of their own work, and ending in the field of indie comics which has refused all this time to own up for its islamophobia in the wake of the Charlie Hebdo shootings - and everything inbetween. A novel size twine essay, standing at over 75,000 words, and covering many subjects within comics. Because of the size of this essay, please take breaks as you read. This is a twine project - simply download the HTML file and open it in your browser, clicking the blue text to go to the next page. Safari users have reported difficulties opening twine, so try other browsers if possible.